Close your eyes. Imagine you’re back in high school flipping through the yearbook and you get to the class superlatives. Remember those? Best hair, prettiest eyes, most likely to succeed. Well, we decided to try our hand at them and ask six mini excavator manufacturers — from Caterpillar to Kubota — to discuss their most popular machines. Yep, they had to narrow down their extensive lineups, sort through the features and pick the most popular. No class voting; just looking at the buying trends and sales numbers. Think of this as our mini excavator page in the yearbook, minus the hassle of writing “keep in touch” in the back. 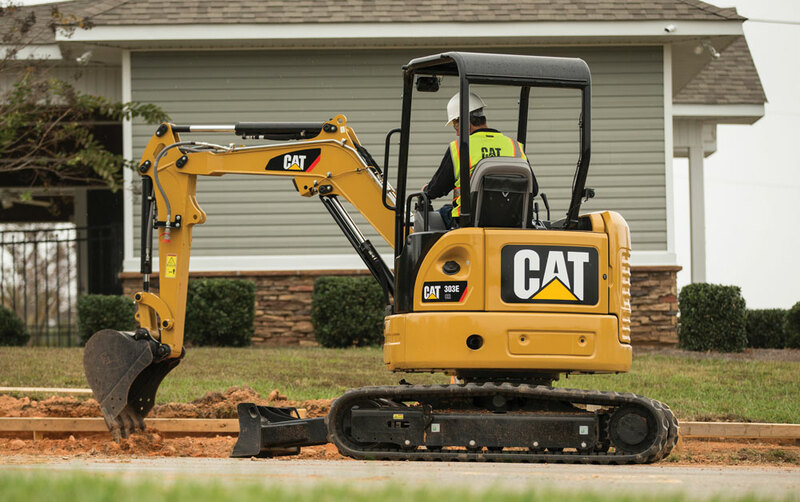 Equipment giant Caterpillar has been manufacturing mini excavators since 1987 and currently has a range of 14 models in the U.S. market — all designed to meet certain customer requirements or needs. The company pinpoints the 308E2 and the 303E as its two top models out of those 14, citing that they lie at opposite ends of the product line spectrum. “These two machines could not be more different but both play a critical role in meeting our customers’ expectations,” says Greg Worley, senior project engineer, Global MHE at Caterpillar. “It comes down to having the right machine, for the right application, for the right customer. Both machines have seen success among various markets. Worley says thanks to its transportability and ease of operation the 303E is becoming a staple unit in the large fleet utility world of water, gas, electric and cable. Last March, John Deere introduced its 30G mini excavator at CONEXPO-CON/AGG and the machine has become a favorite in the marketplace. Why? Dave Young, product marketing manager for mini excavators, says it’s because of its versatility and weight. 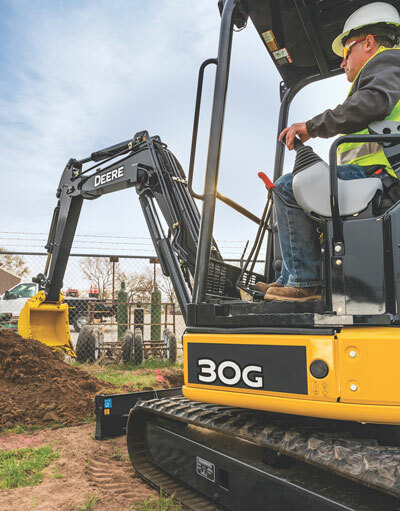 John Deere’s 30G mini excavator was launched at last year’s CONEXPO-CON/AGG, and the machine has experienced great acceptance in the marketplace. Next, Young mentions the 30G’s oversized undercarriage. He says that it adds to the model’s durability and acceptance among heavy-duty contractors. As for track options, Deere offers both rubber and steel insert tracks. Young says the rubber tracks are the most commonly chosen thanks to their ability to cross over and work on a graded road without disrupting the base that has been laid prior to the asphalt or concrete. Over at Kobelco USA, dealer development manager Todd Dohnal says that the 3.5-metric-ton SK35SR is the company’s most popular selling mini excavator. Dohnal highlights the SK35SR’s compact size, noting that operators can easily maneuver in and out of tight spaces, especially in urban areas and planned developments where jobsites are more restrictive. It’s a great machine for the landscape, utility and rental markets. 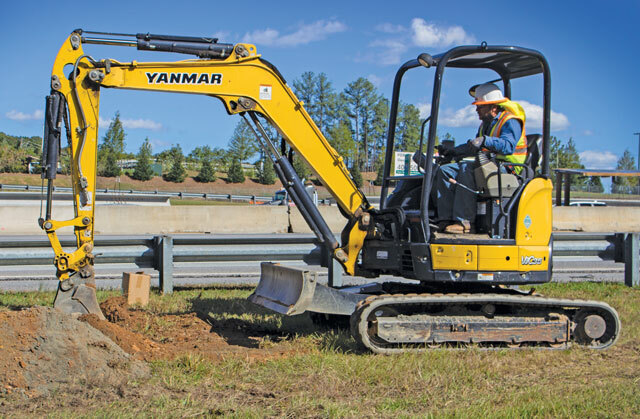 Yanmar America’s most popular selling unit is the ViO35, and it has been well received among customers in the rental, construction, landscaping and utility markets. It’s a popular unit thanks to its portability to and from the jobsite without the need for a CDL. Its unique quick-coupler, which comes standard, is also a big selling point. The ViO35 from Yanmar America comes standard with an exclusive company-designed pin-grabber style quick-coupler. When looking at Volvo Construction Equipment’s mini excavator lineup, product manager John Comrie says that sales are very close between the company’s EC35D and ECR40D models. However, he points out the new EW60E wheeled excavator and the EC60E are also quickly catching up on sales volumes. According to the Comrie, popular features in the lineup include side-engine mounting for easy servicing, a Tier 4 Final engine with no exhaust aftertreatment, easy access to the main control valve, hydraulic filters housed under a single hood and a large roomy cab with a wide door. But that’s not all. Comrie continues to elaborate on the machines. 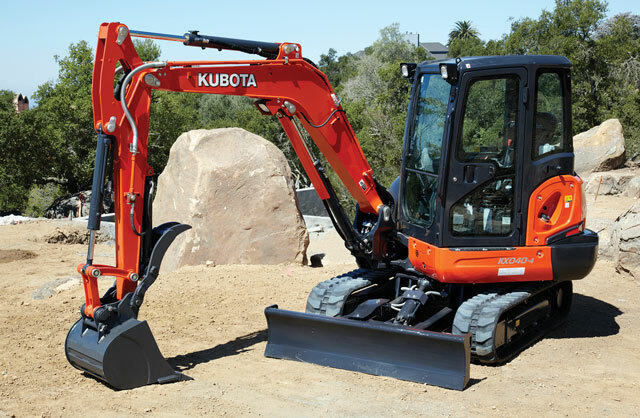 Kubota’s K Series boasts compact excavators that range in size from 1- to 8-metric tons and are available in a zero, tight and conventional tail swing configurations. The KX040-4 holds the title as the most popular selling excavator in Kubota’s compact excavator line. The mini excavator market has experienced several years of growth, and 2018 is projected to see similar success. While discussing Kubota’s most popular mini excavator, product manager for excavators, wheel loaders and TLBs Jeff Jacobsmeyer, gleaned some insight into the market … and things are looking good. To make the EX2 prototype fully electric, the combustion engine has been replaced with two lithium ion batteries which store enough electric energy to operate the machine for eight hours in an intense application, such as digging compacted ground. 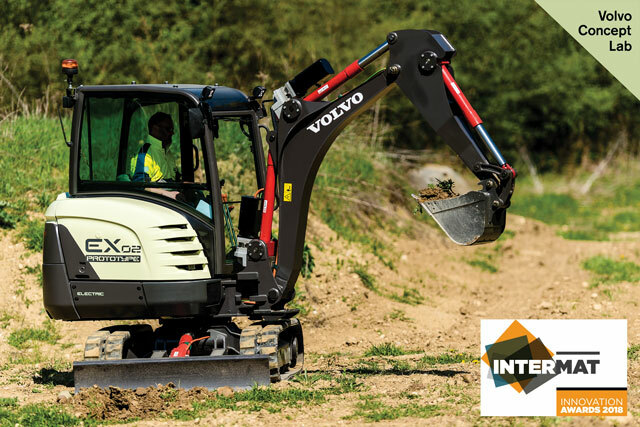 Volvo Construction Equipment’s 100 percent electric compact excavator prototype — known as the EX2 — recently won the prestigious Equipment & Machinery Award in the Earthmoving and Demolition category of the Intermat Innovation Awards. The concept machine, which delivers zero emissions, 10 times higher efficiency, 10 times lower noise levels and reduced total cost of ownership compared to its conventional counterparts, was recognized for its contribution toward progress in the construction industry. It is believed to be the world’s first fully-electric compact excavator prototype. At this stage, the EX2 is still part of a research project and it is not commercially available. Check out more excavator stories here.